Spotify, the world’s most popular music streaming service, on Wednesday made public its regulatory filing for what would be one of this year’s most anticipated initial public offerings. That also means that, unlike a typical initial public offering, there is no restriction or “lock up” agreement preventing current shareholders from selling as soon as they’d like. In a standard IPO, insiders aren’t allowed to sell their shares right away to prevent a wave of selling that could depress the stock price. In the filing made public on Wednesday, Spotify, which has been valued at over $20 billion by private investors, revealed a host of financial details and other internal information it had previously kept secret. The company plans to list its shares on the New York Stock Exchange, most likely within the next few months. $5 billion – That’s how much revenue Spotify, legally based in Luxembourg, took in last year from subscribers and advertisers (calculated at today’s exchange of $1.22 per 1 euro). Revenue rose 39% from 2016. $1.5 billion – That’s the amount of Spotify’s net loss under Generally Accepted Accounting Principles last year, though a considerable amount of the loss (about $1.2 billion) related to changes in the value of various financing transactions. Accounting rules require that a company include such changes in value in their income statement, even though the company hasn’t actually gained or lost any money. On an operating basis, which doesn’t include financial transaction costs or taxes, Spotify lost $461 million. 157 million – That’s how many total users worldwide listened to Spotify at least once in December last year. At the end of the month, the service said it had 71 million users who paid to subscribe to hear music ad-free while another 90 million listened to ads and paid nothing. A few million users may have listened to free trials or dropped the service by month end. The total is a lot more than any other service. Spotify mentions six different times in its filing that: “We believe that our number of Premium Subscribers is nearly double the size of our nearest competitor, Apple Music.” Apple (aapl) is growing faster than Spotify in the United States, however, according to industry sources. 80.4% – Spotify was co-founded by Daniel Ek and Martin Lorentzon in 2006 and launched its first service in 2008. Since then, the pair has held onto control of the company despite taking investments from other groups. Ek, currently the CEO, controls 37.3% of the voting power in the company. Lorentzon, who sits on the board and was chairman from 2008 to 2016, controls 43.1% of the company. Chinese Internet giant Tencent (tcehy) has 2.4% of voting control, which it gained last year in a swap of investment stakes, and hedge fund firm Tiger Global has 2.2%. 79% – Spotify’s biggest expense by far is the royalties it must pay for all the music its users play. The company doesn’t disclose that rate precisely, but it comes close. Spotify reports its “cost of revenue,” which includes the royalties plus a few other up-front expenses like credit card fees. 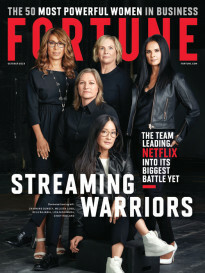 In the past few years, the cost was as much as 88% of total revenue, leaving not much money to pay staff, develop new products or even advertise. 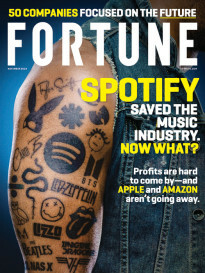 But last year, Spotify renegotiated with the largest record labels including Universal Music Group, Sony Music Entertainment, and Warner Music Group to lower its payments.